Pruning rose bushes? The truth is that whenever I think of pruning my roses my stomach turns. It's amazing how this amazing push gives you both beautiful flowers and prickly thorns - two complete opposites. Personally, I don't like wearing my work gloves, I enjoy feeling things in my hands, but when I think of pruning rose bushes I immediately start wondering where my gloves are. And I highly recommend that you do the same. That’s the 'safety pitch' out of the way, now let's prune those magnificent plants. What do we want to achieve by pruning roses? Additional bloom - meaning you just want your bush to produce more flowers and grow fresh new leaves when in season. A beautiful garden - meaning no dead branches or brown colored leaves. 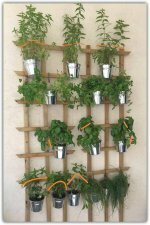 You want your plants to always look shiny and clean, as if you have polished each and every leaf. This is the most important part. We (my daughters and I) prune our roses just before they dry. It's fun and rewarding (when you’re not getting pricked). And yes, my girls know how to prune the entire rose bush by themselves. 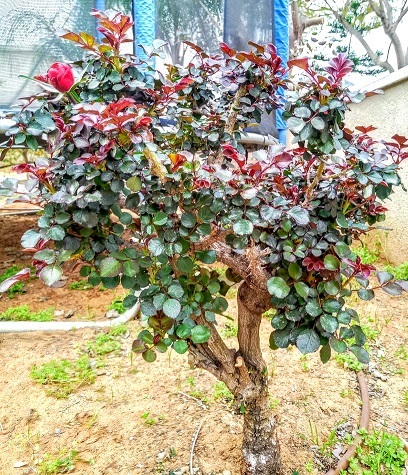 I can talk to you for hours about how to prune rose bushes, but for me it's not just about the roses, it’s about who I spend my time with… think about it – who do you like to prune with? Or perhaps I should be asking, who are you pruning your roses for?? Before pruning. I have noticed a change in the last few years in the way people think about pruning roses. The new approach is to avoid hard (winter) pruning every year, unless the condition of the rose bush requires it. Pruning rose bushes younger than 2 years old is not recommended, so be patient, It’ll be worth the wait! Before pruning your rose bushes, please take a good look to see if there are still flowers blooming. If there are some, cut them gently and make yourself a bouquet. When? Lopping, which means removing dried flowers, leaves and branches, can be done the whole year round. How? 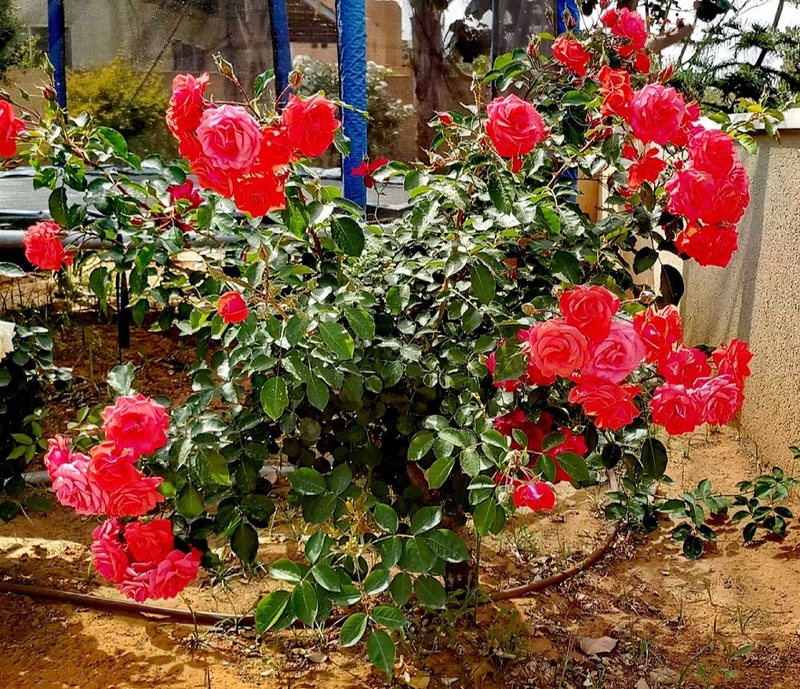 Before you start pruning, take a good look at the shape of your roses bush. Every rose bush has a general form, it kinda’ looks like a bush ;). I recommend starting with the stems of the outer circle, the stems that sit beneath the center circle – it should give you a round canopy shape. If you look at the picture above, you can see that my rose bush has that kind of general round canopy look. I deliberately chose this photo to show you that my rose bush is far from perfect or picturesque. 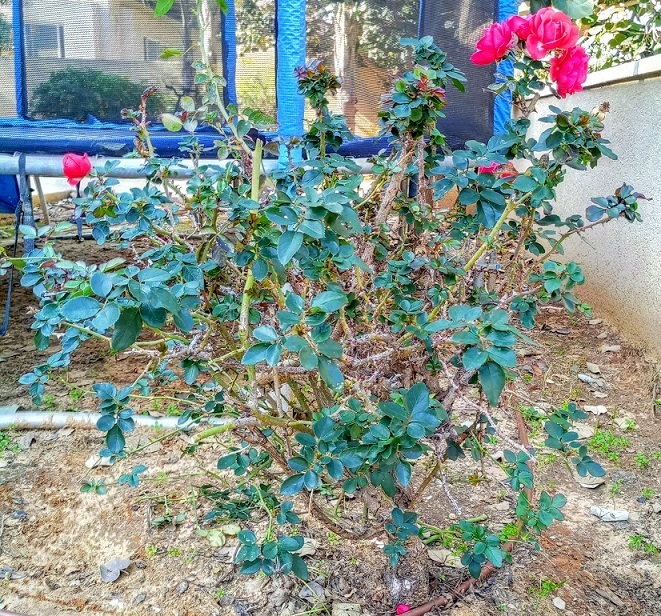 This specific rose bush had been neglected for a while, as you can see from the density, or lack thereof…. It’s undoubtedly a mess, but there is a good reason. In this case, I decided to keep it at the same height throughout the year. It’s just the way I like it. 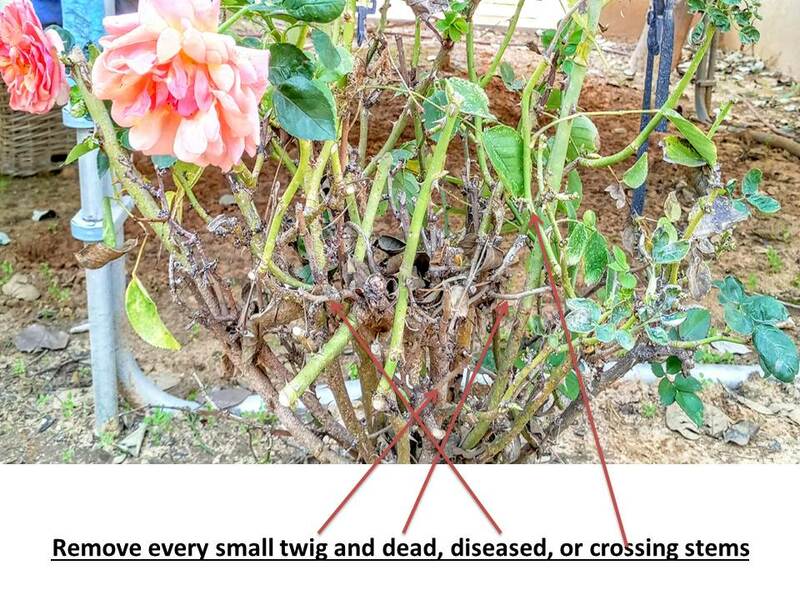 After you’ve made the first cut, you'll have a better view of the inside the rose bush and it will be easier to remove every small twig and dead, diseased, or crossing stem. Crossing stems are those shoots that grow from the stem below the bud - prune them where they start growing – you can be heartless with those - prune your way deeper into the bush and remove those suckers – yes, confidently and with zeal! Shape and prune your roses as they grow. 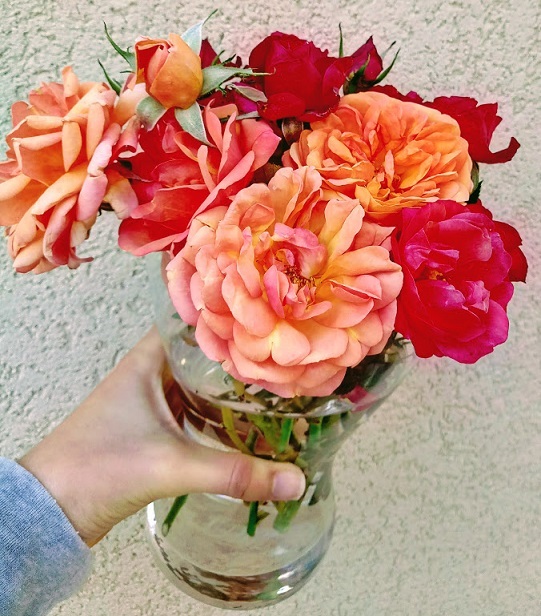 If you keep the height of the stems balanced and the center open, your rose bushes will become your garden's center-piece. This is how my rose bush looks after I have pruned it. 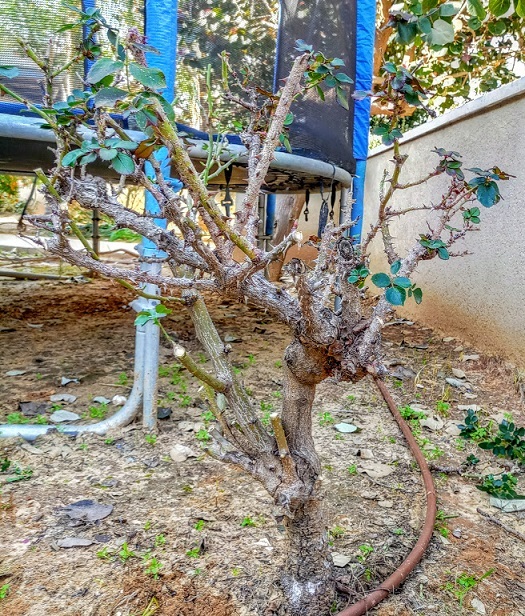 I pruned it in this way that just so I could show you how, but the reality is that it had been so neglected that I really had no choice. That is no reason to prune so hard every season, and even now, I could have pruned it half as much and it would have been fine. The idea is to recognize the pattern, after pruning a rose bushes you can see the shape of a cup. The center is clean and wide open and leading stems are pointing out. Soon enough this bush will be unrecognizable, and one to be very proud of. Pick one stem and follow it from top to bottom. As you scan the stem, you'll come across leaf clusters at different heights. You can see that there are two kinds of leaf cluster - one with three leaves, the other with five. As you move down along the stem, at some point it will become smooth and there will be no leaves, but you will be able to see buds or nodes. In both cases, always prune at least ¼ inch above one of the leaf clusters, or above the node or bud. As you can see in the picture, I marked the place to cut in red. Please also take note of the angle and the correct space above the bud. When pruning rose bushes I use two kinds of pruners: a bypass long straight blade pruner for cutting the stems from the top to the bottom; and bypass loppers with short blades to handle the thicker woody stems. It's now getting exciting. The rose bush is already glowing with new life. Can you imagine how it will look four more weeks?? I think I can safely say... STUNNING!